Update: This targeted offer is likely gone. Instead, consider applying for the Mercedes-Benz AMEX Platinum card for 50,000 points on our Best Travel Credit Cards page, or waiting for the periodic offers of 75,000 points for the AMEX Business Gold Rewards card. 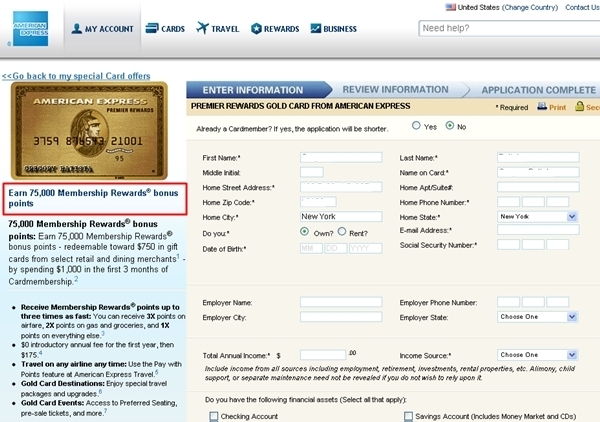 The most recent 75,000 bonus offer for the AMEX Business Gold Rewards was January 21-28 2013. 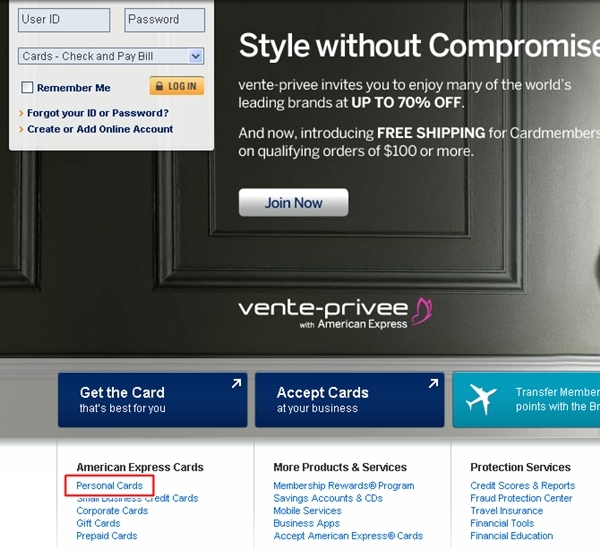 If you missed earlier 75,000 bonus points offers for the AMEX Premier Rewards Gold Card and are not currently an AMEX cardholder, check your AMEX special offers to see if you've been targeted and are pre-approved. 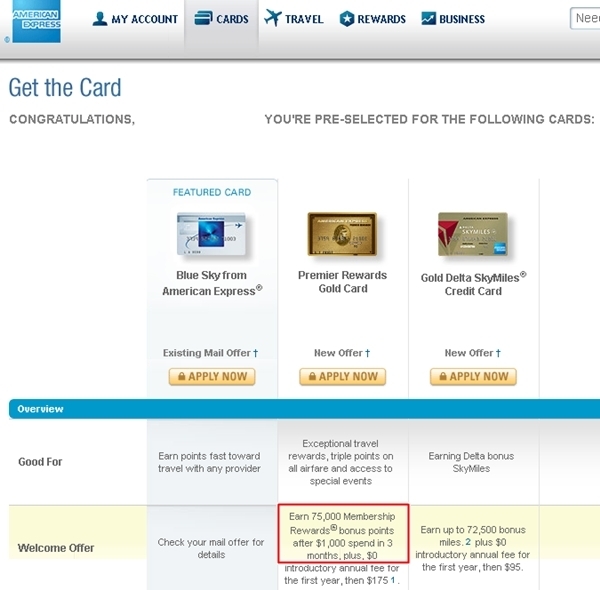 While I was disappointed that there were no special offers for me as an existing AMEX cardholder, when I checked for my husband, I was thrilled to see that he was pre-approved for three card offers, including the AMEX Premier Rewards Gold Card with 75,000 Membership Rewards points after spending $1000. My husband does not yet have an AMEX card, only the Fidelity AMEX with 2% cash back (in other words, not AMEX, since the card is issued by FIA Card Services, owned by Bank of America). 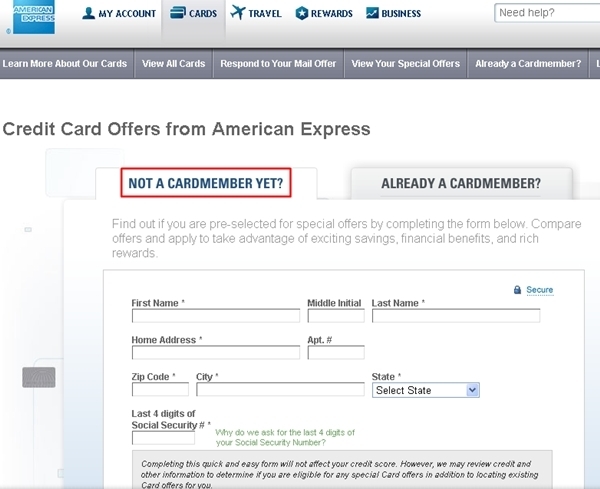 I cleared my cache and cookies so that it wouldn't keep showing me the Web site for existing AMEX cardmembers. Until this quarter's April-June Chase Freedom 5x Grocery Bonus, I put all our grocery spend on the AMEX Premier Rewards Gold, for 2x points. 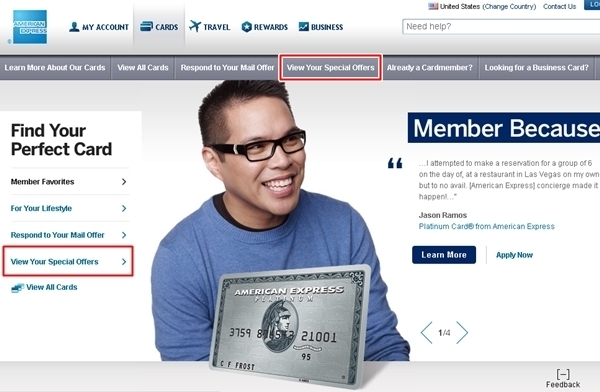 The card also gets 3x on airfare spend, although since we tend to earn most of our miles and points through credit card bonuses and spend, we haven't been able to take advantage of that category bonus as much. The first time I tried submitting the application, I got an error message that AMEX systems were down, along with a phone number to call. My husband called it, but was told that the offer can only be applied for online. No doubt this is to ensure that no one who is not actually targeted gets the offer. And in the application itself the name fields are not editable. So, even if someone you knew opened up the application, you wouldn't be able to apply instead of them since their name is hardcoded into the application. Now, I certainly wish we'd realized he was targeted earlier, so we could have taken advantage of the current 50 Percent AMEX Transfer Bonus to British Airways Avios, but regardless, am glad that my husband is getting this bonus. While I value Ultimate Rewards more highly, Membership Rewards are good to have on hand when British Airways or Delta run transfer bonuses. In the past I've transferred to Aeroplan, but since they devalued their award chart and started imposing surcharges on most partner flights, I probably won't be transferring to them again, especially when those flights can be booked more cheaply with United miles earned from Ultimate Rewards. Credit Card Rewards are Getting Richer…But Are You Getting the Best Deal?